Japan doesn't have much land to spare. Tokyo Leasing Corporation along with Kyocera Corporation have announced a project to built the World’s Largest Floating Solar Plant. 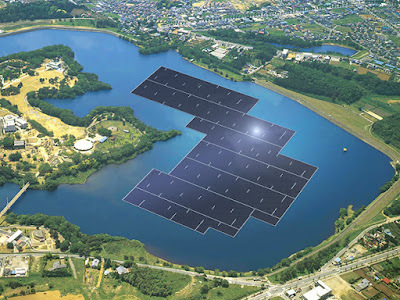 The 13.7 megawatt (MW) floating solar power plant will be built on the Yamakura Dam reservoir. Kyocera had earlier announced building a similar 7.5 MW solar power plant on Umenokifurukori reservoir in Japan. 51,000 Kyocera solar modules will be installed in the waters of the Yamakura Dam reservoir which is an 180,000 square meter area. The project is expected to generate an estimated 16,170 MWh of electricity per year, enough to power up 4,700 typical households. Only three countries in the world-Japan, India, and Australia have built floating Solar Plant so far. The Yamakura Dam project is set to complete by March 2018. Kyocera has built four floating solar power plant in Japan so far since 2014. The company plans to sell the electricity generated from this solar farms to the Tokyo Electric Power Company. Floating solar plant are actually very beneficial. Solar panels in water perform better than that of the land. Algae growth in water can be slowed down by the solar panels which stop sunlight from hitting the water.